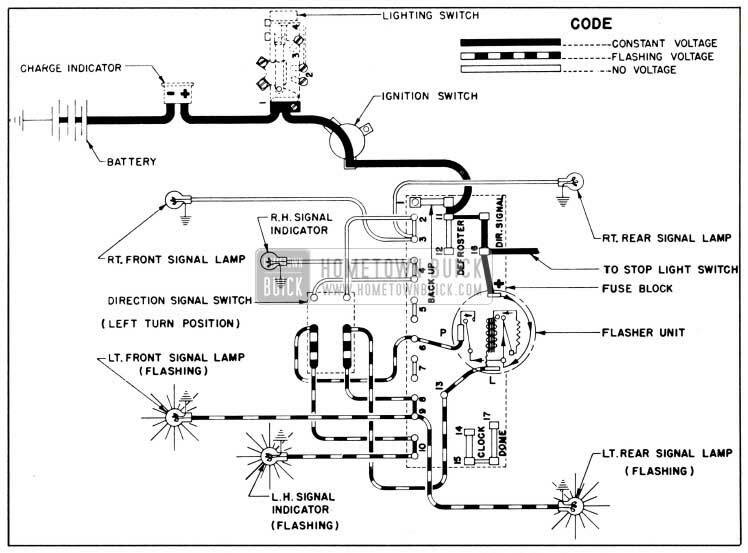 The 1951 Buick horn relay is an electrical switch which closes the circuit between the battery and the horns when the horn button is pressed, and opens the circuit when the button is released. The relay permits control of the horns with a small amount of current passing through the horn button contacts. The high current required by the horns would cause arcing and burning of these contacts. When the 1951 Buick horn button contacts are closed, a small amount of current flows through the relay winding to ground at the horn button. This magnetizes the relay core, which attracts the flat steel relay armature. The armature has a contact point which makes contact with a stationary point to close the horn circuit. When horn button is released, current stops flowing through relay winding so that the core loses its magnetism; the armature spring then causes contact points to be separated. The monogram and bezel assembly is held in the steering w h eel cap base by three springs. The assembly may be removed by inserting a small screw driver in a notch provided in the cap base and prying against the bezel. When the monogram and bezel assembly are removed, the operating ring and wheel base assembly may be removed by removing the three screws which attach the wheel base to the steering wheel hub. See figure 10-93. 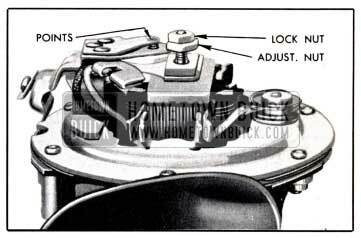 The 1951 Buick horn button assembly used in the solid spoke steering wheel consists of a horn button cap with contact strap, a contact cup, a horn blowing spring, a contact plate, and attaching screws with insulating fibre spacer bushings. 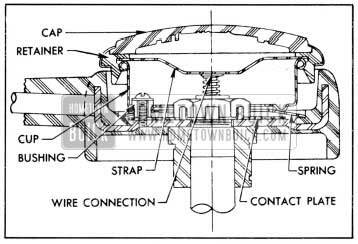 The 1951 Buick horn button cap has a rubber retainer which snaps over the rim of the contact cup and the contact strap bridges between the horn wire connector in steering shaft and the rim of contact cup. The contact cup is attached to steering wheel hub by three screws and insulating fibre spacer bushings which permit movement of the cup when button cap is pressed. The screws and bushings hold the flat steel contact plate tight against the wheel hub. The dished steel horn blowing spring is placed between the cup and contact plate, with outer rim of spring resting on a shoulder of the plastic material of wheel, which provides insulation. See figure 10-94. 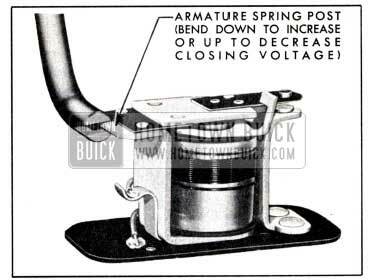 Whenever 1951 Buick horn button parts are assembled into the steering wheel the dished horn blowing spring must be installed so that clearance exists between inner edge of spring and the contact plate. See figure 10-94. The contact cup must be installed with the locating notch in rim in line with lower spoke of steering wheel so that the horn button cap emblem will be properly located when cap is installed. Increasing the current draw increases the horn volume. Too much current will produce a high cut-in voltage, which will cause a sputtering sound and may cause horn to stick in cold weather. The 1951 Buick directional signal lamps are incorporated in the front parking lamps and the rear combination tail, stop and 1951 Buick signal lamps. Each front parking lamp contains a 21-3 CP lamp bulb; the 3 CP bulb filament is used for parking and the 21 CP bulb filament is used for the directional signal light. Each rear lamp contains a separate 21 CP lamp bulb for the direction signal light, which operates independently of the tail and stop lights. When the 1951 Buick direction signal lights are flashing, a signal indicator bulb on instrument panel also flashes, producing a small arrow of green light to indicate the direction for which the signal has been set. For a left turn the green light flashes in the left side of the charge indicator, and for a right turn the green light flashes in the right side of the gasoline gauge. The cam is a hardened steel ring with two diametrically opposite elongated notches. It is installed on the shouldered hub of steering wheel with three brass washers and a spring washer, all being retained by a snap ring. The brass washers and spring washer from a friction clutch which facilitates shifting of the cam to adjust switch for proper timing, and coincidentally prevents accidental locking or jamming of the steering wheel by the 1951 Buick signal switch mechanism. Since the direction signal lights are independent of the headlamp lighting switch and thermo circuit breaker, the wiring circuits are protected by a “Direction Signal” fuse on the fuse block under the cowl. The Tungsol flasher is also mounted on the fuse block, which serves as a terminal block between the 1951 Buick signal switch and the chassis wiring. The 1951 Buick direction signal lights are independent of the parking and stop light circuits, and the indicator lamp bulb sockets are grounded to the instrument panel. 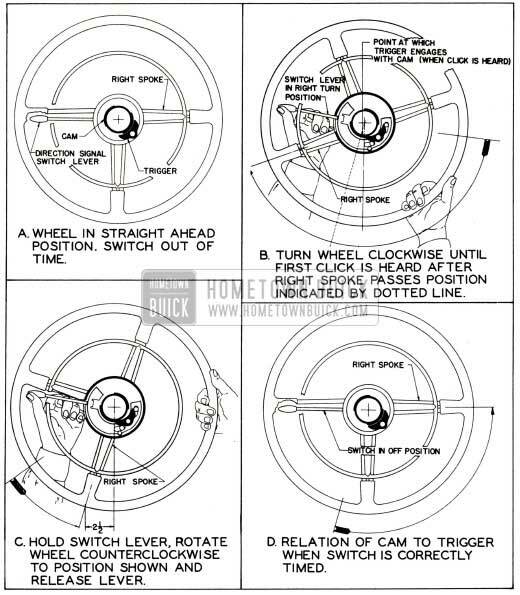 If the 1951 Buick direction signal switch cam is correctly located on the hub of steering wheel, the switch will automatically return to the “off” position following a turn, provided that the steering wheel has been turned at least one-third revolution. If the wheel has been turned less than one third revolution, the switch must be manually returned to the “off” position. Move switch control lever up to indicate a right turn, then rotate steering wheel clockwise until click is heard as the switch trigger drops into a notch in the cam, or a slight movement of control l ever is felt. The steering wheel should have been turned at least one-third revolution at this point. See figure 10-102, view B. Hold control lever up firmly and slowly turn steering wheel counterclockwise until the right horizontal spoke is approximately 21/2 ” to the left of the straight-down position. This will cause the cam to slip in its friction mounting on the steering wheel hub. See figure 10-102, view C.
Release hold on control l ever and turn steering wheel to straight-ahead position. The switch will automatically return to “off” position as the wheel is turned. No further adjustment is required for a left turn. 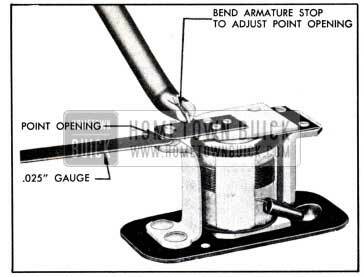 See figure 10-102, view D.
The clutch friction for maintaining the 1951 Buick signal switch cam in the correct position on steering wheel hub is controlled by a crimped steel spring washer. See figure 10-103. If trouble is experienced in maintaining proper timing and adjustment of the cam, the spring washer is probably flattened and too weak, permitting the cam to turn on hub. To check the clutch friction, note the pressure required to hold the control lever while slipping the cam in step 3 above. Compare with another car on which no trouble is experienced. See paragraph 10-64 for replacement of cam or clutch friction parts. 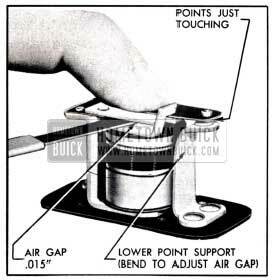 Set 1951 Buick direction signal switch in “off” position and remove steering wheel (par. 7-S}. Install steering wheel (par. 7-5) and set the timing of signal switch cam (par. 10-63). Disconnect 1951 Buick signal switch wires from fuse block under the cowl. Set direction signal switch in “off” position and remove steering wheel (par. 7-5). Insert a small rod through hole in lever plate, pry up on lever retaining spring and pull switch control lever out. See figure 10-103. 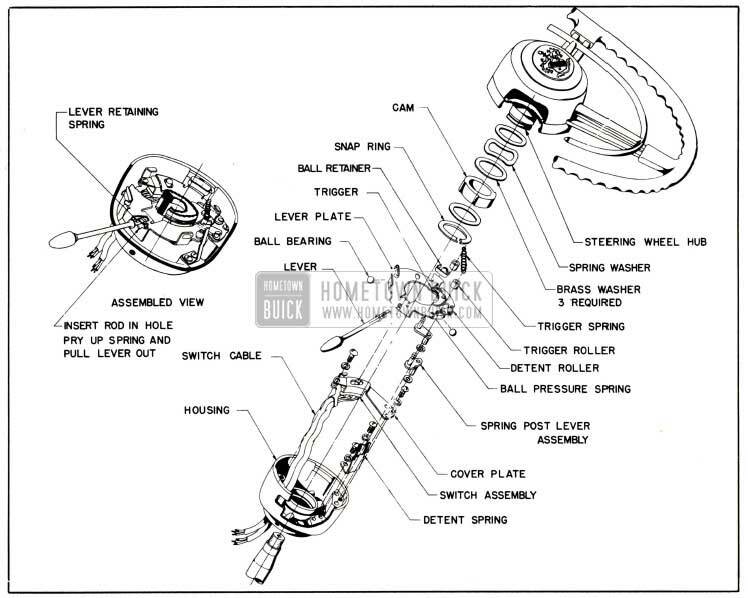 Remove spring, then remove rollers from outer ends of both spring post levers. Remove the ball retainers from the upper and right ball bearing seats on lever plate by prying on one end of retainer. Slide the three steel balls out of their grooves. Pry the lever plate lower guide out far enough to clear edge of plate then remove the lever plate, tilting it to clear the upper guide. Lift out the two spring post levers, which have flat washers on the lower pins between levers and switch cover. Remove two switch cover attaching screws, then carefully work the switch wiring through opening in steering column jacket while lifting the signal switch and cover plate assembly fat enough to provide access to switch terminals. Unsolder wires from old switch terminals and solder them to terminals of new switch, using rosin core solder. Do not use acid core solder. 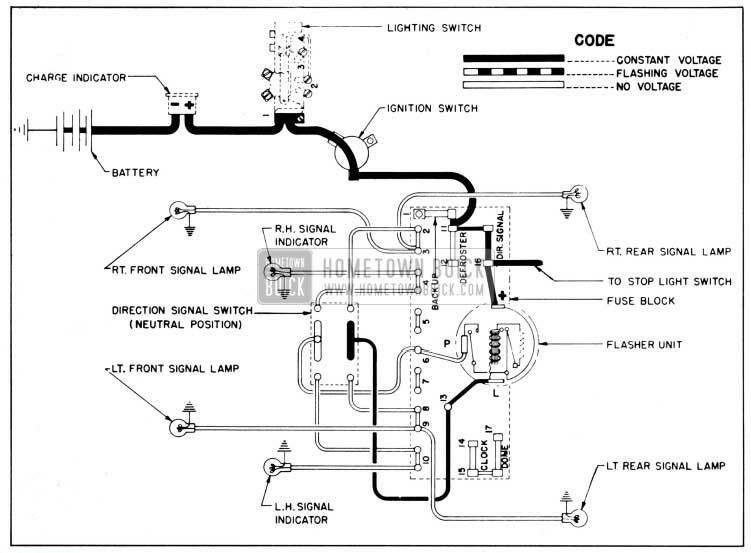 See chassis wiring circuit diagrams in Section 10J for wire color codes and proper connections to switch. Work switch and wiring down into place and install switch cover attaching screws with lockwasher. Install both spring post levers, making sure that flat washers are on lower pins between levers and switch cover. See figure 10-103. Tilt the lever plate to get it under the upper guide and make sure that switch handle and both spring post lever upper pins enter their proper slots as plate is pushed down into place. Engage the detent roller on lever plate in the detent spring mounted in lower side of housing. Place one steel ball in the grooves in switch housing and pressure spring on lever plate, then slide the other two balls into their grooves. Install the two ball retainers at upper and right hand ball seats on lever plate. See figure 10-103. Lubricate the three balls lightly with petroleum jelly. Carefully bend the lower guide back over the edge of lever plate. Clearance between top of lever plate and the guides should be as close as possible without rubbing or interference (approx. 1/64”). Place rollers on spring post lever pins and install the spring over both pins. Push control lever into lever plate until inner end of lever engages inner hole in plate and retaining spring snaps into recess in lever. Place switch in “off” position and install steering wheel (par. 7-5). 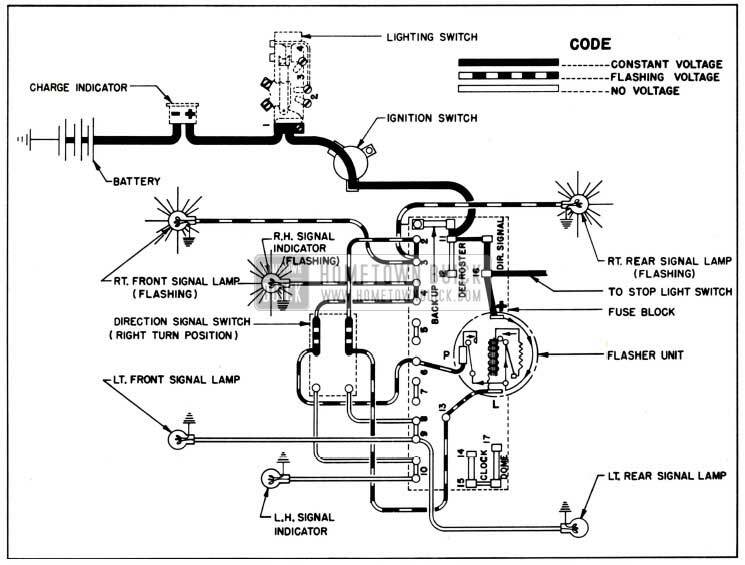 Connect 1951 Buick signal switch wires to fuse block under cowl in accordance with wire code colors as shown on chassis wiring diagrams in Section 10-J. 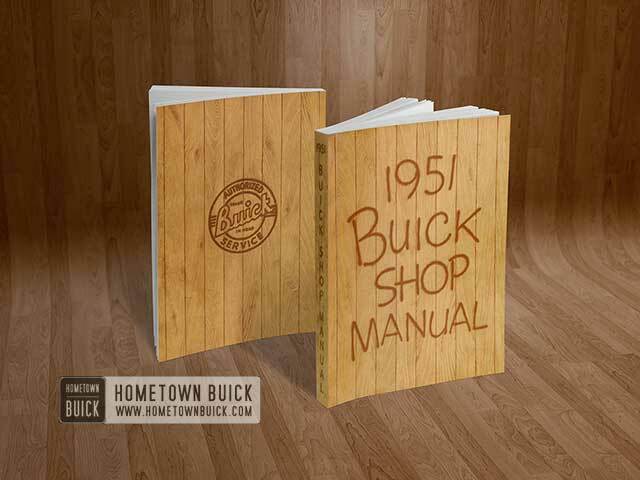 Check timing of 1951 Buick signal switch cam (par. 10-63).